Speedliner® NZ was registered as a company in New Zealand in October 2003. It is directed and run by Grant Paterson who saw the benefits of Speedliner® and started importing the product into New Zealand as an alternative to other products being used in the country. Speedliner® NZ has an excellent working relationship with Industrial Polymers who are very impressed with what Speedliner® NZ has achieved in the short time it has been operating. Speedliner® NZ also has a strong relationship with Speedliner® Europe who have developed a lot of innovative ideas for the Speedliner® product. There are currently 20 Speedliner® applicators throughout NZ with the opportunity for more to join. 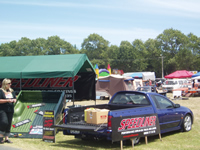 Speedliner® has strived to work with professional and reputable car painters to apply product to ute decks. To view our current applicators throughout New Zealand click here. There is one company that uses the product on decks under stock crates and they apply the product themselves. Speedliner® NZ has achieved success by importing and marketing the best product available for top car painters to ad onto their business. These applicators are not only in cities but in small towns to help with accessibility to Speedliner® . Our main opposition now has only five applicators left and they are in major cities.